After several months with virtually no precipitation, people in Beijing stormed social media with photos of Tuesday morning's snowfall, while asking why it has been so dry in Beijing and why the snow came so late this winter. Meteorological experts reached by the Global Times on Tuesday said that it was caused by global warming that has delayed moisture and cold air from entering Beijing. Official data shows that the first snow day in Beijing normally comes around November 29, but the first snowfall of this winter was nearly 70 days late. 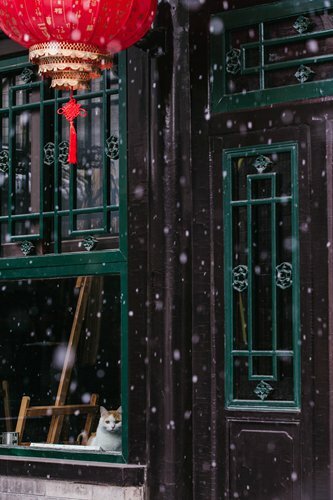 The first snowfall this winter was on Sunday morning when Beijing saw a light layer of snow in the city and was barely noticed by busy city dwellers. The snow on Tuesday was more visible and is expected to end later that night. This winter's first snow is the fourth latest snow on record. The other three latest first snowfalls occurred on February 11, 1984, February 10, 2011 and in February 7, 2014, according to news site chinanews.com. Millions of excited netizens posted snow photos and videos in Beijing, as if they had never seen snow in their life. The hashtag BeijingSnowing on social media platform Sina Weibo has been viewed more than 500 million times as of press time. Some netizens suggested that Tuesday's snow was artificial snow, and others said the late snow was connected to air pollution in the capital. Wang Gengchen, a research fellow at the Chinese Academy of Sciences' Atmospheric Physics Institute, told the Global Times the late atmospheric circulation caused by global warming cannot transfer enough warm and cold currents to Beijing, but global warming won't necessarily make the snow in Beijing late in the future due to varied local climatic conditions. Zhang Mingying, a meteorologist at the Beijing Meteorological Service, said Beijing's special terrain also weakens the transport of water vapor from entering Beijing. On Monday, the Forbidden City became one of the most popular protagonists in the many snow photos posted by netizens. Tickets of the Forbidden City had been sold out days earlier during the Spring Festival holiday, and many expressed their pity at not getting to see snow on the imperial palace on Tuesday. The famed imperial Jingshan Park was swarmed with visitors looking for a bird's eye view of the Forbidden City and the snowy capital.